Last night, Robin slept well. We had a nice breakfast, and Robin chased the cat again. Then we packed up, checked out and loaded everything into a pony & cart to make out way to the harbour. Robin loved the trip with the horse, and there was another horse and cart following us so he could watch the horse close up.Once we checked in to the ticket office, we had to wait for an our at the dock. It was really hot and poor Robin was tired and getting frustrated. We took turns holding him, and I took him down to the beach to get his feet wet, but my thong broke. The fast boat was called Wannen Bali. The boat docked on the beach rather than the harbour, so I had to strap Robin into the baby carrier and climb carefully into the boat, around the side and into the hull. We went via Gili Trawangan, and true to form, Robin fell asleep almost instantly as soon as we left port. After a 2 & 1/2 hour boat ride, we docked and had to get a taxi to Kuta, which took another 2 hours. Robin was pretty well behaved, but was getting understandably bored and frustrated towards the end. We booked a room, even though our flight leaves at 1am so we won’t be staying overnight. We checked in, then headed out for some food. We bought a chicken soup (bakso) from a street vendor & ate it in the side of the road. It was delish! Next, we walked around and looked at some shops, but we really didn’t want to buy anything. I stopped and got an hour long massage, while Suzy took Robin for a walk. Once the massage was finished, we went down to the beach to watch the sunset. We bought Robin a corn in the cob, and we had a nasi campour each. Just before sunset, huge storm clouds rolled in and the rain started. It was really heavy so we sheltered under a big umbrella for 10 minutes until it lighted up. The beach went from very busy to deserted quite quickly. Once back at the hotel & dry, Suzy went out for a massage while I put Robin to bed. Overnight, Robins fever got worse. I woke up with him at about 4am, and he was burning up. I breastfed him for a little while, before measuring his temp of 37.7 & waking mum up. We stripped him down, gave him some panadol and put him in a cool shower. He started to cool down, so we all went back to sleep. In the morning, thankfully his fever had broken and was back to normal. We had breakfast, then got ready for a swim in the pool, but Robin wanted a nap beforehand. He ended up sleeping for a few hours, which gave Suzy a chance to go pick up some food for lunch and go to the harbour to buy fast boat tickets for our trip back to Bali tomorrow. She rented a bike from the resort, which made travelling around the island much easier! When Robin woke up, we had an early lunch, then we finally made it to the pool for swimming, while Suzy went for a snorkel. We spent about half an hour in the pool, then it was time to get out & so I could get ready for my SCUBA dive! I rode the bike to Scallywags diving, as it started to rain. It wouldn’t be a holiday if it didn’t rain at least one day! The dive was close to Lombok, and we saw some really big lion fish. They are very pretty and look like they have feathers on them. We also saw tiny shrimp and some clown fish – one of which was very territorial and bit the instructors finger! While I was diving, Suzy and Robin played outside with seed pods, sand and flowers. After the dive, I met up with Suzy and Robin, who had hired another bike, this one with a baby seat. We went and had a cup of tea and a salad, then rode across the island to find a place to watch the sunset. Robin loved being on the bike! He was an absolute star & looked very cute in the baby seat. The rain cooled the whole island down, so I think that made him happy as well. We went to an outdoor restaurant on the west coast to watch the sunset. The sky was magnificent with the storm clouds and sunset over the water. I’m glad we got to see a good one for our last night. Robin was more interested in harassing a cat, but hopefully one day he will look at the sky as well. We had a light dinner, then headed back to pack. On the way back, I was bargaining for some souvenirs, and Robin started to complain at just the right time, so I could say “I have to go, this is what I’ll pay, yes or no” they vendor said “yes, ok, for the baby, but it’s very cheap” haha! I probably still paid too much, but I don’t mind. Maybe I can train Robin to be my haggle buddy. After breakfast this morning I walked down to the SCUBA dive place to go for a dive. The site was called Turtle point, and certainly lived up to its name! We saw a number of big turtles, one as big as me. We also saw a peacock mantis shrimp, which was pretty special. They are brightly covered prawn looking things. There were lots of other colourful fish, eels, nudibranches and pretty coral.After the dive I walked. A lot see what Robin and Suzy had been up to. While I was away, Robin had a morning nap, then they had gone for a swim in the pool and a paddle in the ocean to look at the little fish. Robin was a bit grumpy, and felt hot. I checked his temp and it he had a mild fever. Looks like his one year measles vax is making him sick again, like it did in Mexico. I have him some panadol, but he had a big spew a few minutes later. The rest of the afternoon was spent indoors, napping, breastfeeding and having a couple of vomits. Poor little boy. Suzy had a nap, then went out for a snorkel while Robin was sleeping. After sunset, we walked around to a wildfire oven pizza place for dinner. The island had cooled down quite a bit and had a lovely ocean breeze. The man at the restaurant felt robins head and got worried, so convinced us to call the island doctor. I wasn’t worried though, his fever is low (under 37.5) and he had been keeping fluids down since about 4pm. The doctor never came, so we said we would stop by the clinic on the way home & get a cold compress. When we got to the 24hour clinic, and it was closed! A local guy called the doctor, and it turns out he went to Lombok. The other doctor on the island had also left. Whoops! We trudged home, gave Robin some panadol in a bottle of milk, and went to bed. For breakfast this morning, Robin had banana pancakes with Nutella. He thought it was amazing. He then proceeded to chase the cats around the breakfast area. The cats are too smart though, and run from him as soon as he starts moving towards them. He really likes the cats. 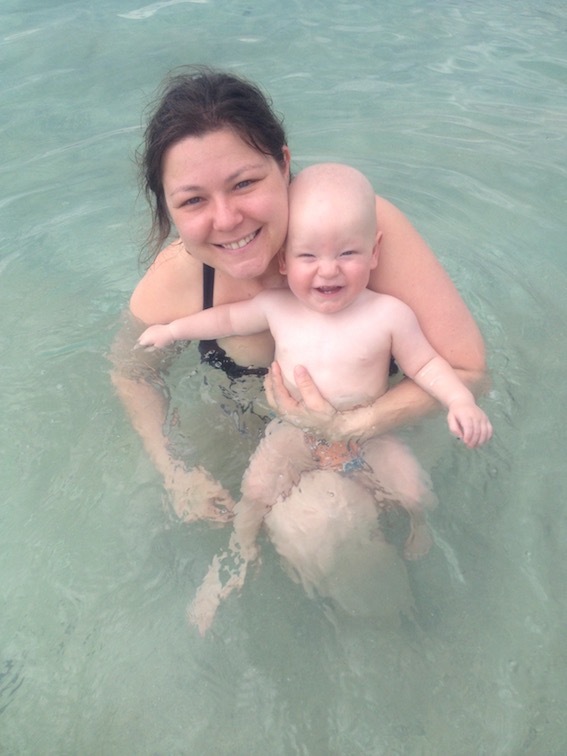 We spent the morning by the pool, where we had a lovely swim, then Robin feel asleep while Suzy gave him a bottle. He had a nice long sleep while we sat on the lounge chairs in the shade, watching the silly Europeans sunbaking & getting burned. For lunch, we walked through the island to Warung Padang and had a mix of traditional Indonesian food. We dropped of our washing on the way through to the warung. 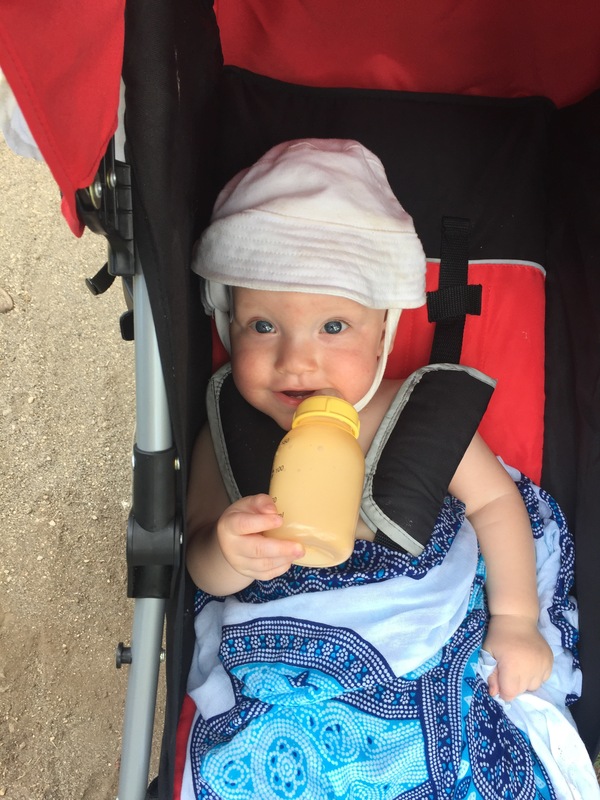 Robin ate Tempe and corn on the cob, and drank fresh coconut water from his bottle. In the early afternoon, we slowly made our way back to the resort, stopping along the way to buy some things. 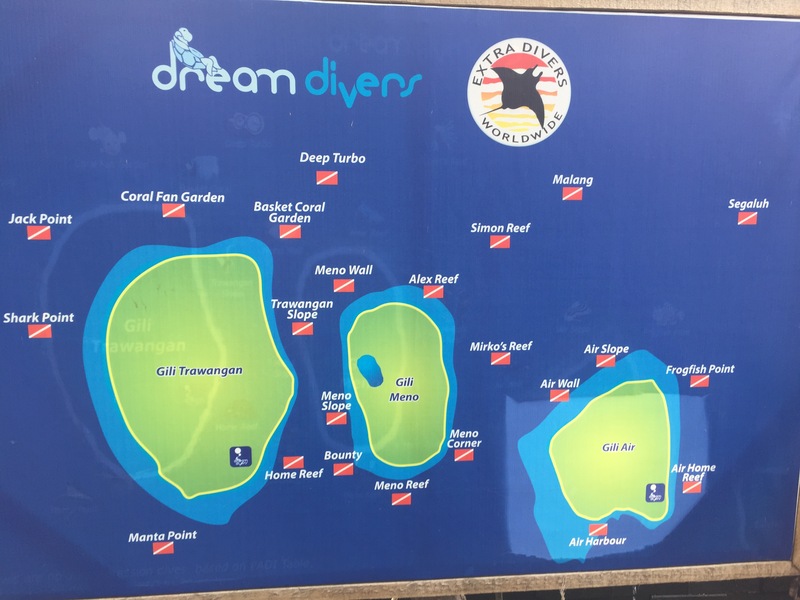 I also booked in another dive for tomorrow morning. Once back, we cooled down with air conditioning, cold water and showers. In the late afternoon, I convinced Suzy to go snorkelling just in the beach out he front of where we are staying. She came back an hour later raving about how amazing it was, and convinced me to check it out. It really was incredible! I saw an octopus, lots of colourful fish, sea urchins and stone fish. All right outside our door! Suzy even saw a sea snake! We left again at sunset to walk around the island, but the sunset was obscured again by a lot of cloud on the horizon. We kept walking around and found a street vendor selling corn on the cob, freshly cooked over hot coals. We bought one for Robin, a bargain at only $1.50. We then found a restaurant to have in, but poor Robin was very hot and tired. He was entertained by the cats for a while though. The walk back was pretty tough, it as still hour and I had Robin in the baby carrier in front of me, which puts weight in my back. He likes it better than being carried on my back though, because he can see more. We walked through the dark backstreets through the island for about 40 minutes until we finally got back and collapsed. Thankfully Robin was happy to go to sleep pretty much as soon as we put him down. We had a little sleep in this morning, until about 7:30-8. We had breakfast or banana pancakes and scrambled egg, before goin to the beach for a morning swim. Robin played with his stacking cups in the water & picked up pieces of broken coral. For morning tea, we went to Pacamama cafe, where Robin had a red dragon fruit smoothie. It went all over him and he loved it. I had a salad and ice coffee, which were both really nice on another hot day. We went to a shop to get some supplies and nasi campur for lunch. Nasi canpur is rice and other stuff like chicken, beans, fish, sambal and egg, all wrapped up in a price of grease proof paper. It’s very yummy and only about $2. The afternoon was once again spent indoors avoiding the heat. Robin was like an energiser bunny and was crawling around a lot and playing with everything he could get his hands on. There was no afternoon nap. At 4:30, we headed out to do a lap of the island, and Robin fell asleep in the pram before we even left the house. We walked around to the harbour, then continued in to Mola resturant to watch the sunset with a drink and a serve of Gado Gado (veggies with peanut sauce) The sunset was not as impressive tonight, but still nice to watch. For dinner, we had to carry the pram a long way over sandy paths. We made it to a resturant in the beach where we had a wood oven pizza, and Robin had green beans, potato and pizza for dinner. We again had to carry the pram with Robin in it back to the hotel through sandy paths, which is a big workout! Once we returned, the power went out! This often happens on the island, so people are pretty used to it. It kept going on and off overnight, which we could only really tell by the fact that the aircon would stop. Another early morning, which is actually really nice. The island is quiet and cool before the hot sun hits. We had breakfast together before I went off to Scallywag Scuba for my refresher course and dive. Suzy and Robin went for a walk and saw some chickens, then played with stacking cups and read some stories. In my dive, I saw some giant turtles, clown fish, parrot fish and eels. The reef was lovely, and it was nice to be back diving. My last dive was just before I became pregnant! I met up with Suzy and Robin at 12:30 for lunch. We ate quite a lot of food, and it is all so good! 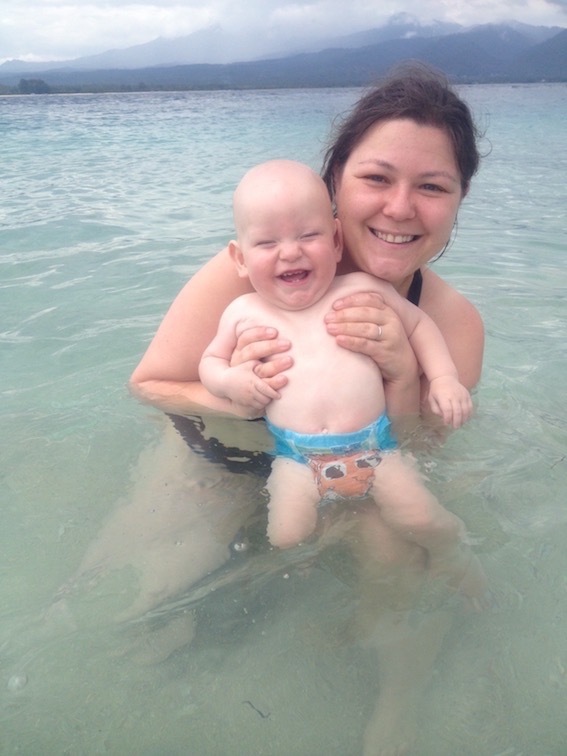 After we ate, we went down to the beach and got Robin changed into a swim nappy. I took him out into the water for another swim, and he seemed to be warming up to the ocean a bit. Certainly not nearly as scared as he was in Mexico! On the hot walk back to the resort, we saw chickens, cats and cows. There was a boy who had a pet roster, and held it close for Robin to see. Robin was very unsure about it, and didn’t really want it near him. After the walk back to the resort, we spent the afternoon indoors again. The hottest part of the day is a bit unbearable. Suzy took Robin out for another walk in the pram at 5pm, before meeting black up with me for a seafood BBQ dinner. Robin crashed out at 6pm, so we put him in the pram and went to dinner. He slept through the whole thing. The resort was hosting a party, and had fireworks, a bonfire and loud music. None of it disturbed our baby, so he must have been exhausted. We didn’t stay for the festivities, but I watched the fireworks from our room. We could hear the music, but because I was also so tired, it didn’t bother me and I went to sleep early.